It’s time to face a harsh truth of IT life: Your network is almost certainly going to be breached. Best practices now recommend adopting an “assume breach” strategy for as the way to reduce security risks to your environment. According, the August edition of SysAdmin Magazine focuses on Windows Server security, detailing a mix of new and time-tested techniques to help you protect against, detect and respond to threats in your Windows Server environment. 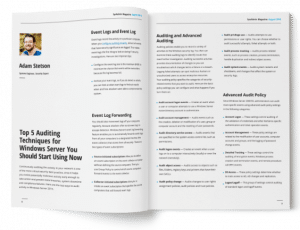 Discover the 5 key IT security auditing techniques available in Windows Server 2016 such as auditing and advanced auditing GPOs, event log forwarding and audit collection services. With a tiered administration model based on ESAE, you can smarter restructure the assigning processes of privileged access in your organization. Learn how to use that tool. Freeware tool that delivers visibility into what’s happening in your Windows-based server infrastructure. It tracks changes to your Windows Server configuration, such as the installation of software and hardware, and changes to services, network settings and scheduled tasks. Attackers often try to compromise local user accounts to get a foothold in your network. By keeping a close eye on who has permissions on your servers and workstations, you can quickly detect any deviations from a known good baseline and respond accordingly, hardening the security of your IT systems.